Deputy Sheriff Tony Hinostroza's vehicle reportedly left the roadway at struck a utility pole as he was attempting to join the pursuit already underway. He was pronounced dead at the scene. Image courtesy of ODMP. 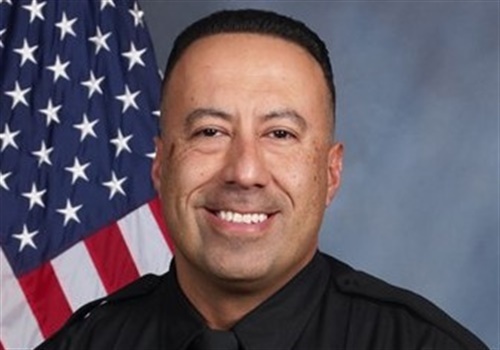 A deputy with the Stanislaus County (CA) Sheriff's Department was killed in a single-vehicle crash Sunday night as he responded to assist other deputies who were involved in a suspected DUI vehicle pursuit, according to KGO-TV. Deputy Sheriff Tony Hinostroza's vehicle reportedly left the roadway and struck a utility pole as he was attempting to join the pursuit already underway. He was pronounced dead at the scene. The pursuit started after deputies had been called to check on the welfare of a subject who was sleeping behind the wheel of an SUV. As the deputies contacted the man he accelerated away from them, leading them on a pursuit, police say. The subject involved in the vehicle pursuit reportedly fled on foot and fought with deputies after spike strips were successfully deployed. He was charged with fourth offense DUI, felony evasion, and resisting arrest. Deputy Hinostroza was a Marine Corps veteran and had served with the Stanislaus County Sheriff's Department for 19 years.